Trees are a gift from Mother Nature. They provide an aesthetically pleasing foundation for our all of our Tampa landscaping services. And, with proper selection and care, trees can thrive for decades. But there is much more involved than just putting a tree in the ground. It is critical that you choose the right tree and the right location to get the most from your tree. Pruning is important to ensure the health of a tree, as well as to safeguard public safety and maintain visibility. By using the natural pruning method, you maintain the natural shape of a tree or shrub. Regular maintenance from a Tampa lawn care company such as ours will help ensure your trees live longer and are healthier. We offer a full range of tree services which include assisting you in picking and properly planting new trees, removing and/or replacing dead trees, and pruning and trimming to help promote the trees’ natural growth patterns. Proper management is of utmost importance in preventing turf disease. Most of the time, improper lawn care practices are the key reasons diseases develop and spread. The poor practices include improper watering, improper fertilization, nutrient deficiencies, excessive thatch and improper mowing. Effective disease management centers on avoiding these problems through sound turf management and prevention of plant stress. Fungicides are not always necessary and should only be used as part of a total management program. But, just as we sometimes need supplements and disease prevention treatments to help our bodies, our landscaping will usually look and do better when a properly balanced program of supplemental feedings (fertilization) and disease prevention (herbicides and fungicides) measures are used. It is almost always less expensive to prevent a problem then to treat it. Nothing sets off a property or garden at night as much as a well designed lighting package. 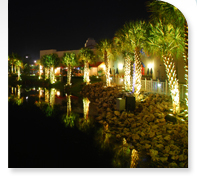 Our Tampa landscaping experts will guide you through the entire process of selecting and installing a low voltage lighting system. We will work with you to plan your budget and schedule the installation. We can also make modifications and repairs to existing systems. We offer new systems using the highest quality fixtures in the industry, modifications to existing systems, repairs to existing systems and bulb replacements. Mulch is a landscaper’s best friend. It performs many diverse functions which include: insulating the soil; retaining moisture; raising soil temperature; reducing weeds; reducing soil compaction; and reducing lawn mower and string trimmer damage. It also adds an aesthetic touch to any landscaping. Stones can be used as accents to improve the aesthetic appeal of any landscaping. Stones are also an excellent way to introduce natural colored ground cover, which complements the landscaping. We offer bulk delivery and installation of many different types of mulch, soil and stones. Our Tampa lawn care and landscaping company offers a variety of other services relating to landscaping and landscaping maintenance. In addition, we occasionally partner with other companies who offer services we do not when our customers request it, in order to have a single point of contact for their property maintenance. One example is commercial pressure washing. We carefully select the companies we partner with to make sure the quality of their work meets our high standards. Some of the additional services we offer include: sprinkler system installation, repair and maintenance; debris removal and hauling; and other hauling and/or removal. Call 813-290-7282 today for a Free Estimate!